With the ability to go up to 250 miles on a charge, the Bolt is a good option for someone who might never have considered an EV before. Consumer Reports today announced that seven new vehicles made its 2018 Annual Top Picks list—the Toyota Corolla and Toyota Camry, Toyota Sienna, Chevrolet Bolt, Ford F-150, BMW X3, and Audi A4. The Top Picks list of 10 cars and trucks was released at the National Press Club in Washington, D.C., before the respected Washington Automotive Press Association. The all-electric Bolt earned Top Pick honors in Consumer Reports’ (CR) new Compact Green Car category. The distinctive-looking hatchback delivers very good range, brisk acceleration and tight handling at a mainstream price of $38,424 as tested. Three of CR’s 10 Top Picks were repeats from the 2017 list, the Chevrolet Impala, Subaru Forester, and Toyota Highlander. CR named a total of four Toyota models to its Top Picks list, the most of any manufacturer. In addition to the compact Corolla and the midsized Camry, Toyota also has the top-rated Highlander midsized SUV and the Sienna minivan. Getting named a Top Pick is no small feat, but impressive reliability and standard Automatic Emergency Braking and Forward Collision Warning helped Toyota secure those four spots. The only other manufacturer with more than one vehicle in the Top Picks list is Chevrolet, with two—the Bolt and the Impala, a large sedan. The F-150 tops the full-sized pickup truck category. The best-selling vehicle in America is an impressive workhorse that pulls ahead of the pack thanks to its weight-reduced design and fuel-efficient turbocharged six-cylinder engine. In order to be designated a Consumer Reports Top Pick, a model has to have an exemplary Overall Score in its vehicle category. This single number consolidates the findings from four key pillars: road-test performance, predicted reliability, owner satisfaction, and safety. A car that beats its competition by these measures is truly extraordinary. Consumer Reports’ 2018 Top Picks list, Car Brand Report Card and more are available in the Annual Auto Issue, and online at CR.org/April. LARGE CAR: Chevrolet Impala ($39,110 as tested). The Impala continues to be a gem among large cars, providing a driving experience that’s akin to a luxury car. The spacious, quiet cabin is well-dressed with high-quality materials and trim. Handling is commendable, as proven in CR’s accident-avoidance maneuver, and when confronting corners at CR’s 327-acre Auto Test Center in Connecticut. COMPACT CAR: Toyota Corolla ($20,652 as tested). This practical, fuel-efficient sedan has all the virtues that small-car shoppers seek, backed by its strong reliability track record. The Corolla has a relatively roomy interior, with a spacious backseat. Handling is secure and its ride quality is a cut above for its class. The ho-hum engine with middling power won’t excite drivers, but delivers 32 mpg overall. COMPACT GREEN CAR: Chevrolet Bolt ($38,424 as tested). The Bolt offers consumers further proof that mainstream electric cars can deliver strong driving performance. This pure electric is built around a 60-kWh battery pack that holds a generous charge, reducing any anxiety of running out of power and getting stranded. The driver sits high up in the Bolt, with a commanding view on par with a small SUV. COMPACT SUV: Subaru Forester ($27,145 as tested). This is a practical, smartly packaged small SUV that emphasizes fuel economy, room, visibility, and reliability over trendiness or flash. People can get in and out easily, there’s plenty of passenger room, and it drives well. The standard 2.5-liter engine provides decent performance and offers exceptional fuel efficiency. MIDSIZED CAR: Toyota Camry ($26,364-$28,949 as tested). The Camry has earned its reputation as a competent, well-rounded family sedan. With its recent redesign, Toyota added more styling flair and better handling. Fuel economy also improved to 32 mpg overall in CR’s tests with the base four-cylinder engine. The hybrid LE version returned an impressive 47 mpg overall—almost up there with the Toyota Prius. MIDSIZED SUV: Toyota Highlander ($41,169-$50,875 as tested). Three-row SUVs have become the vehicle of choice for many families. They provide all-weather traction and roomy interiors without looking like a minivan. The Highlander stands out with its good performance, fuel economy, and reliability. It’s large enough to accommodate eight passengers but small enough for relatively easy parking. MINIVAN: Toyota Sienna ($38,424 as tested). Minivans are the ultimate solution for moving people and their stuff. In this segment, the Sienna offers the best all-around package with a comfortable ride, an energetic powertrain and respectable fuel economy. The spacious cabin features convenient folding seats and available seating for eight. FULL-SIZED PICKUP TRUCK: Ford F-150 ($52,535 as tested). An impressive and innovative workhorse, the F-150 pulls ahead of the pack thanks to its weight-reduced design and turbocharged six-cylinder engine. This pickup delivers a standout 19 mpg overall, quick acceleration, and effortless towing ability from the potent 2.7-liter turbocharged V6 engine. LUXURY COMPACT CAR: Audi A4 ($48,890 as tested). The A4 shines by being sporty, luxurious, and polished in a competitive category. It’s very satisfying to drive, with nimble, secure handling helped by its minimal body roll and responsive steering. The powerful turbocharged four-cylinder engine accelerates with gusto, proving ever-eager to make a quick getaway, yet fuel-efficient. LUXURY COMPACT SUV: BMW X3 ($53,745 as tested). Redesigned for 2018, the X3 tops its class. This luxury compact SUV combines driving enjoyment, comfort, slick technology, and utility in an appealing package. Its sharp, sporty handling encourages drivers to seek curvy roads. 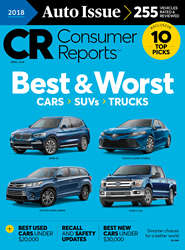 Complete details on Consumer Reports’ Top Picks for 2018, Car Brand Report Card, Best and Worst Lists and other key findings are available in the Annual Auto Issue of Consumer Reports or online http://www.CR.org/april. Watch a livestream of CR’s media conference on Facebook, Twitter and Youtube. Consumer Reports’ testing procedures are the most comprehensive of any U.S. publication or Web site. More than 50 individual tests are performed on every vehicle, including evaluations of braking, handling, comfort, convenience, safety, and fuel economy. Roughly 6,000 miles of general driving and evaluations are racked up on each test car during the testing process. CR buys all its test cars anonymously from dealers and does not accept free samples from automakers for any of its ratings or evaluations. For live coverage of CR’s breaking news, connect on Twitter at @ConsumerReports and on Facebook at http://www.facebook.com/ConsumerReports.